The ground convulsion resulting from North Korea’s underground nuclear bomb test in January has been mapped by Europe’s Sentinel-1a radar satellite. The EU spacecraft uses a technique called interferometry to sense surface movements. Its data shows rock above the blast zone going down by up to 7cm in one area and rising 2-3cm in another. The imagery was released by Germany’s Institute for Geosciences and Natural Resources (BGR). It advises the federal government on matters related to the Comprehensive Nuclear-Test-Ban Treaty (CTBT). The 6 January event was described by North Korean media as a miniaturised hydrogen bomb detonation, but there has been no independent confirmation of this claim. 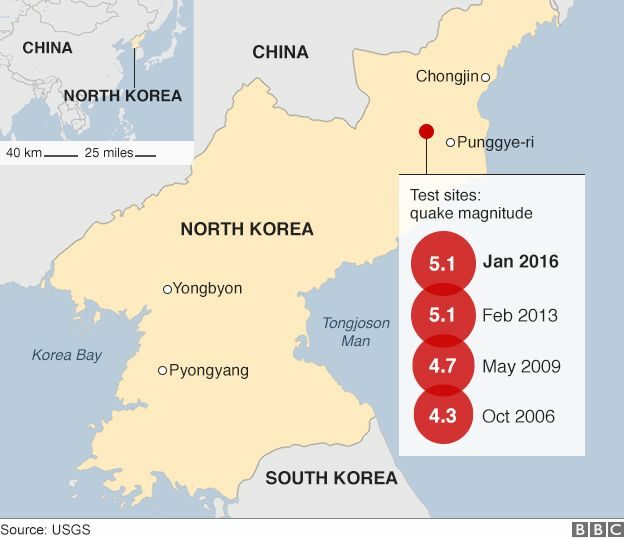 All of North Korea’s tests (2006, 2009, 2013, 2016) appear to have occurred at a site called Punggye-ri, also known as P’unggye-yok, in a remote region in the east of the country, near the town of Kilju. The data picked up by international seismometers has given very good location information, but the new Sentinel imagery refines these estimates further. Satellite interferometry works by finding the difference in “before” and “after” radar pictures of the Earth’s surface. It allows even quite subtle ground movements to be detected. Sentinel-1a got its first view of the test site following the explosion on 13 January, and this was compared with an observation acquired on 1 January. The effects of both subsidence and uplift are evident. “This is a very important result because in the past the location of nuclear tests was based only on seismological data and now we have an indication from other technologies,” said BGR’s Nicolai Gestermann. At the moment, the 12-day repeat in observations is the best this radar satellite can achieve, but on Friday a sister spacecraft will be launched by the European Space Agency that should reduce the re-visit time to just six days. Because of the gap in time between the blast and the subsequent image retrieval, scientists cannot say whether the ground deformation occurred at the same time as the detonation or a few days later. Seismologists say the bomb test had a magnitude of 5.1. Its characteristics were very similar to the previous explosion conducted in 2013, suggesting the 6 January event was not, as claimed, a thermonuclear blast, said Dr Gestermann. The estimated yield was 10 kilotons of TNT-equivalent, plus or minus three kilotons, he added. The BGR scientist was presenting his institute’s work here at the European Geosciences Union General Assembly.